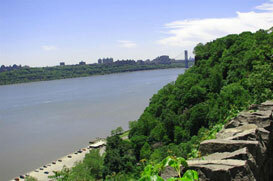 The borough of Englewood Cliffs is nestled in New Jersey’s Bergen County. It is the headquarters of three business bigwigs—LG, Unilever, and CNBC. On top of that, automotive giants Ferrari and Maserati have their North American headquarters in this borough as well. Englewood Cliffs was established in 1895 which resulted from a referendum between Palisades Township and Englewood Township. According to the 2010 U.S. Census, Englewood Cliffs has 5,281 residents, a slight decrease from its population a decade ago. Forbes ranked Englewood Cliffs as the 78th most expensive zip code in the U.S. This borough highlights a suburban vibe complimented by a wide array of restaurants, shops, and tourist landmarks. Residents also benefit from Englewood Cliffs’ excellent location which makes it closer to major transportation routes including three airports. There are 1, 818 households registered in this borough which translates to about 1, 559 families.